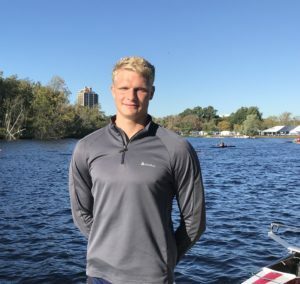 While the German 22-year-old singles scull sensation Oliver Zeidler may not be a household name to Head of the Charles Regatta fans–yet–internationally he has burst onto the rowing scene with a flourish. Zeidler won gold in the 100-meter, and bronze in the 200-meter freestyle events. Nonetheless, he fell just short of the needed times for the 2016 Olympics, and shortly thereafter found himself losing interest in swimming. He quit the sport to focus on his job and studies, thinking his career as an athlete was in the past. Since then, Zeidler has been on the fast track with no signs on slowing down. After winning the men’s indoor rowing competition at the 2017 World Games in a time of 5:42, Zeidler finished third at the 2018 German small boat championships, earning him a call-up to the national team and eventually a spot at the World Rowing Cup I in Belgrade, Serbia. “After finishing third in Belgrade, I knew that I had what it takes to row amongst the world best,” Zeidler said. His 2018 season confirmed that, as he made the A Final in his first world championships. Ahead of his first Head of the Charles start, Zeidler remained very modest in his expectations. “I only started my full training program one week ago, therefore I just want to give it my best and use this race to see where I stand amongst the competition. The main goal for this year is to throw myself into tough regatta conditions. My father and I talked things over and thought that this race would be the perfect way to start this new season,” Zeidler said. Heino Zeidler, Oliver’s father and coach, has played a major role in his son’s success. “Of course there are moments where having your father also be your coach can be challenging, but the pros certainly outweigh the cons. I can talk to him about anything that is on my mind and because I live at home, I have a great support system around the clock,” Zeidler said. It also has allowed Zeidler to be more flexible with his training sessions, which has been a major benefit in a very busy day-to-day schedule, something his 19-year-old sister Marie-Sophie greatly respects. “Picking up rowing and establishing yourself amongst the world’s best in such a short amount of time is very admirable, especially because I am striving to reach similar heights. It’s amazing how he is able to balance all of his responsibilities while studying, working and rowing. It’s something only my brother can do,” she said. After a career in rowing, Zeidler hopes to continue to work as a tax consultant, a field in which he has already gained three years of experience. “While this area may seem boring or dry to some people, I really enjoy it and can see myself in this business after rowing. For now, my goal is to finish my last year of studies and fully focus on the goals I have set for myself in rowing,” Zeidler said. The ultimate goal, of course, being the Olympics. “First and foremost I want to make sure that I secure my spot for next year’s world championship as soon as possible. Beyond that, my target is to win my first international race, but ultimately, I hope to represent Germany at the 2020 Tokyo Olympics,” Zeidler said. A win at his first HOCR is beyond his wildest dreams Zeidler admitted. But then again, so was a career as a world-class rower just two-years ago. Regardless of this weekend’s result, Zeidler is a name that must be reckoned with in the coming years, not only at the Head of the Charles Regatta but at events around the world.